Finally, the time has come to confront the oni Akinaru and stop his plot to unleash a flood of evil beings upon the world. The tyrannical nation of Chu Ye is a perilous place for anyone who isn't an oni, but you're not the type to let a little peril stop you. Your armada of ships and army of undersea fishfolk is ready to go toe to toe with Chu Ye's navy so you can storm the nation in search of your nemesis. Prepare for an epic showdown, complete with daring heists, flying ships, and a climactic final battle. This adventure includes a challenging optional sixth adventure, for characters who wish to deliver an even more crushing defeat to Akinaru in a mystical realm. 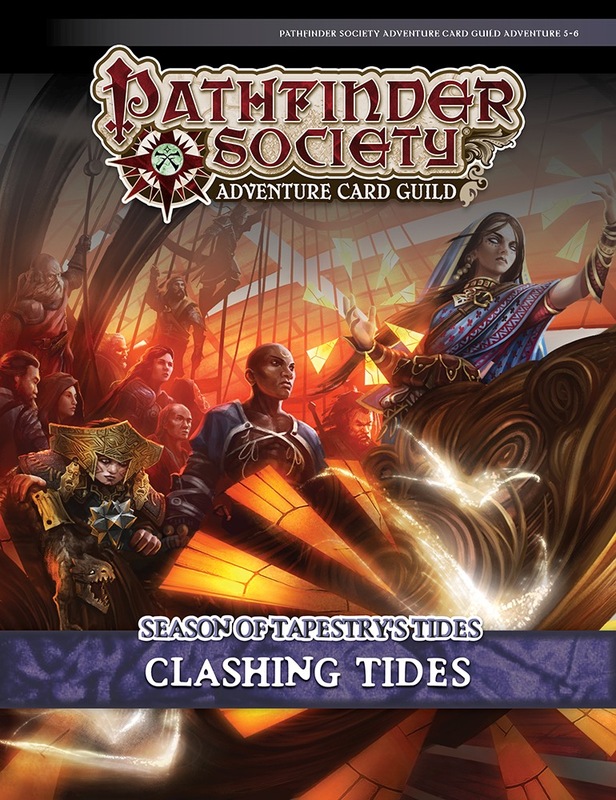 This Pathfinder Society Adventure Card Guild scenario bundle contains six scenarios, an adventure card, the adventure path card for Season of Tapestry's Tides, and Chronicle sheets for players to keep track of their progress. These scenarios require the Skull and Shackles Base Set as well as the Raiders of the Fever Sea, Tempest Rising, Island of Empty Eyes, The Price of Infamy , and the From Hell's Heart Adventure Decks. Groups of 5 or 6 players also require the Skull and Shackles Character Add-On Deck. Mechanical Design by Keith Richmond. Story by Mark Seifter. 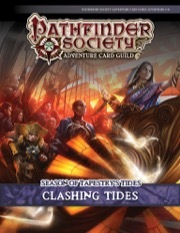 Sign in to start a discussion about Pathfinder Society Adventure Card Guild #5-6: Clashing Tides PDF!